 Future, current, previous standard cost estimates (costing type 01). Transfer of cost estimates in the same plant. 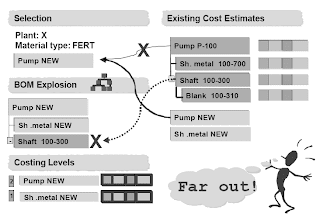 Cross-plant transfer of cost estimates. When you cost a new product, you can avoid having to recost the entire product structure by transferring automatically existing (such as released) cost estimates for assemblies and raw materials.In Customizing for transfer control, you can specify what cost estimates are used. 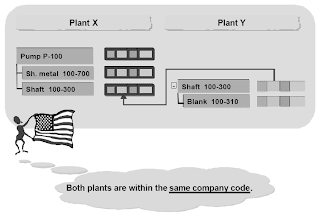 The key for transfer control is assigned to the costing variant.Requirement: You must use the same cost component structure. The system first searches for a material cost estimate in accordance with transfer control. It then proceeds according to the material valuation strategy. This does not apply to multilevel unit costing when you are transferring with drag-and-drop. In such cases, you can only transfer the cost estimate as the original or as a copy. Example of application: You want to ensure that all the materials in your plant have a standard cost estimate. To this end, you define a transfer control ID whose sole strategy is to find a current standard cost estimate. After selection (and structure explosion), you receive all the materials that do not have a current standard cost estimate.In the General Data section of the costing run, the transfer control ID is proposed from the costing variant. 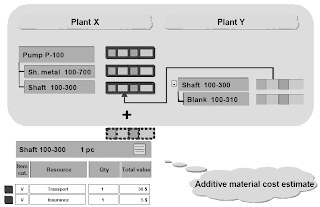 Selection: When selecting, the system also checks whether a material cost estimate already exists for the material in accordance with transfer control. If one exists, the material is not included in selection. In the above example, Pump P-100 is not selected.Exception: If you select Always recalculate, the check step with transfer control does not apply. n Structure explosion: The BOMs are exploded for the selected materials. 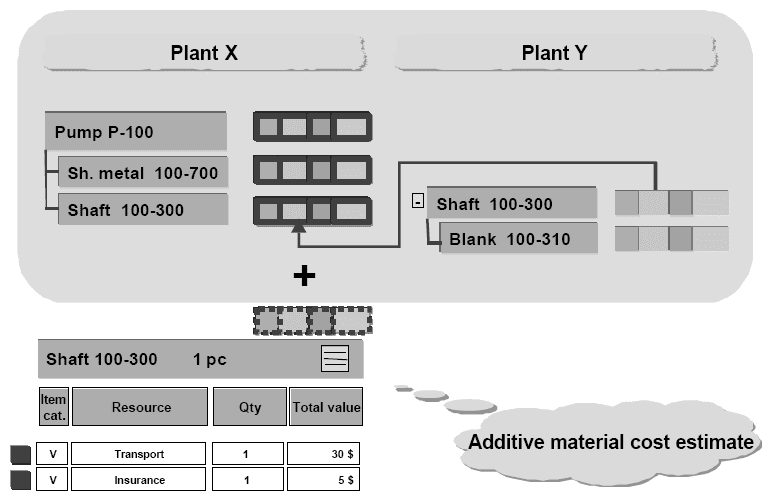 The system then checks whether material cost estimates according to transfer control exist for the components. If cost estimates exist, the components are not included and are not further exploded. In the above example, this applies to Shaft 100-300. Adding known costs to the material cost estimate with quantity structure that are not contained in the quantity structure. In the above example, they are transport or insurance costs. When valuating material components, you can include manual costs for each material price, or use manual costs only (as controlled by the valuation variant). Transfer of cost estimates from non-SAP systems.An additive cost estimate is inserted into a cost estimate with quantity structure. You use the unit costing functions to create the additive cost estimate. The costing variant controls whether the additive cost estimate is included in an automatic cost estimate. The costing type, valuation variant and version of the automatic cost estimate must correspond with those of the manual cost estimate. The quantity structure date of the automatic cost estimate must be within the validity range of the manual cost estimate.To handle additive costs (such as applying overhead), cost elements are required. One cost element is assigned for each cost component (in the settings for the cost component structure). You can also distinguish between cost elements by using origin groups. 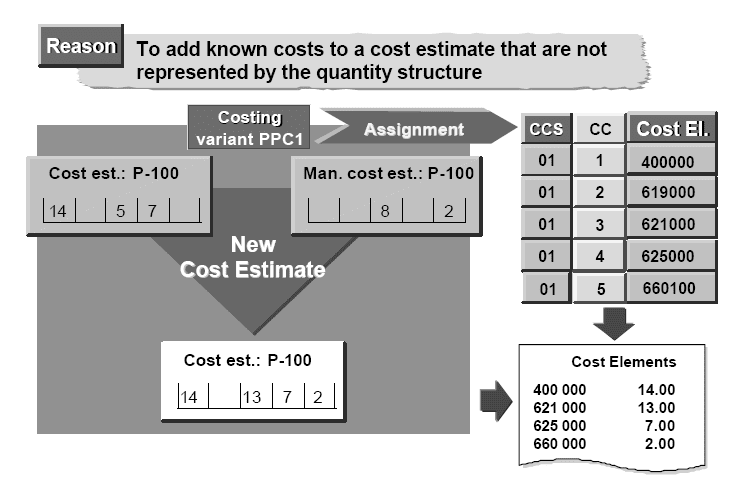 The costs calculated in an additive cost estimate are added to the costs calculated in an automatic cost estimate the next time costing is performed.The costing variant controls whether an additive cost estimate is included in an automatic cost estimate.The costing type, valuation variant, and version of the automatic cost estimate must match those of the additive cost estimate. 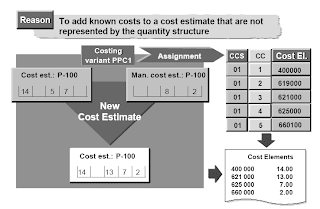 The quantity structure date of the automatic cost estimate must be within the validity range of the additive cost estimate.When valuating material components, you can include manual costs for each material price, or use manual costs only (as controlled by the valuation variant).Cost elements are required to handle manual costs (such as to apply overhead). One cost element is assigned to each cost component. You can also distinguish between cost elements by using origin groups.